The cardiovascular system is categorized into the pulmonary circuit as well as the systemic circuit. The blood among the heart and the lungs is transported by pulmonary circuit, which is made up of arteries and veins. The circuit starts at the right ventricle and terminates at the left atrium. The arteries of the systemic circuit carry oxygenated blood as well as nutrients to all organs and tissues, from the left ventricle, eventually sending deoxygenated blood towards the right atrium. The pulmonary circuit is short Compared with the systemic circuit. The base of the pulmonary trunk is merely around 15 cm or 6 inches away from the lungs. The arteries of the pulmonary circuit carry oxygenated blood that is different from the systemic circuit in which they carry deoxygenated blood. That’s why the pulmonary arteries are shown in blue color in most of the color diagrams that is the same color as systemic veins. Blood going inside the right atrium comes back from the peripheral capillary beds, where discharge of oxygen and absorption of carbon dioxide takes place. The pulmonary circuit starts when, this deoxygenated blood, after traveling through the right atrium and ventricle, enters the pulmonary trunk. At the lungs – Oxygen is absorbed, carbon dioxide is discharged and for distribution through the systemic circuit, the oxygenated blood is send back towards the heart. The pulmonary trunk produces the left and right pulmonary arteries as it turns above the superior border of the heart. Before branching repeatedly these large arteries enter the lungs, producing smaller and smaller arteries. Capillary networks that enclose alveoli are supplied by the pulmonary arterioles which are the smallest branches. The walls of these small air sacs are sufficiently thin for gaseous exchange among the capillary blood as well as inspired air. While leaving the alveolar capillaries, oxygenated blood enters venules which then combine in order to form larger vessels that carry blood toward the pulmonary veins. These four veins empty into the left atrium and complete the cycle of pulmonary circuit. 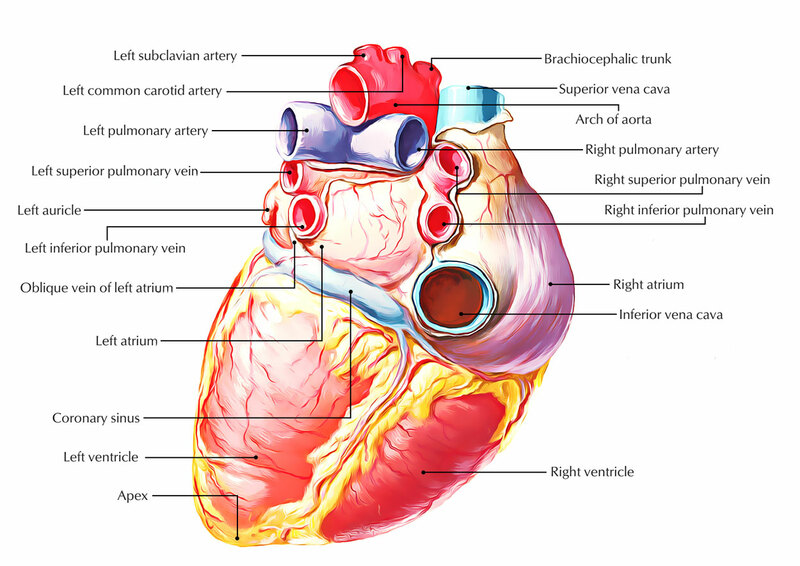 The heart has four hollow compartments – Left Atrium, Left Ventricle, Right Atrium and Right Ventricle. The pulmonary circuit propels blood from the right parts of the heart—the right atrium as well as right ventricle. The systemic circuit pumps blood by the left parts of the heart—the left atrium and left ventricle. Pulmonary circuit delivers deoxygenated blood towards the lungs in order to get it oxygenated. To excrete carbon dioxide that is a waste product of energy production in cells.